A strong winter storm last night dumped heavy snow on New York and New Jersey, also pummeled by Hurricane Sandy last week – even forcing FEMA to shut its doors to families in need. FEMA shuttered its recovery centers, which were set up to offer assistance to those most affected by the monster storm, and the Staten Island office closed “due to bad weather”. The Nor’easter rattled the East Coast with high winds and piles of wet, slushy snow on Wednesday – leaving thousands of Sandy victims without power just after it had been restored. Adding to the mess, the three major airports in the tri-state area closed, commuter trains slowed service, and mass transit lurched to a halt, inflicting another round of misery on the city’s residents. The storm dropped nearly four inches of snow in Central Park, which areas of southern New Jersey suffered more than 9 inches, the National Weather Service said. Residents from Connecticut to Rhode Island were also slammed with up to six inches of snow, while areas of Massachusetts had a whopping eight inches. Carrying gusts of 60 mph, the storm brought down tree limbs and electrical wires damaged by Sandy. Utilities across the two states in New York and New Jersey reported that nearly 60,000 customers who lost power in the superstorm lost it again. “It’s Mother Nature’s one-two punch,” Mayor Cory Booker of Newark, New Jersey, told CNN. Airlines cancelled at least 1,300 U.S. flights in and out of the New York metropolitan area on Wednesday, causing a new round of disruptions that rippled across the country. And on the roads, icy conditions brought traffic to a crawl. Despite this newly-inflicted chaos and slushy sidewalks across the tri-state area, schools across New York City opened on Thursday, including 43 schools still without power or damaged by Sandy. Transit systems have also spluttered back to a start, with the Long Island Rail Road running all lines by 5:00 a.m. except for the Long Beach line. Commuter traffic also reopened in the Holland Tunnel, where around 90,000 vehicles pass under the Hudson River between Manhattan and Jersey City, New Jersey. Airlines at the city’s airports were also scheduled to resume flights on Thursday, but officials warned travelers to check with their carriers ahead of the storm. The states’ utilities reported scattered outages on Thursday, with some customers complaining that they had just gotten their electricity back in the past two day or two, only to lose it again. The Long Island Power Authority said 200,000 customers were without power, with around 50,000 losing it in the new storm. Con Edison reported the storm knocked out electricity to about 60,000 customers in New York City and Westchester County. On Thursday, these customers included 21,000 in Queens, 7,000 in Brooklyn, 4,000 in the Bronx, 3,900 in Staten Island and 140 in Manhattan. Public Service Electric & Gas reported 160,000 outages, including 40,000 caused by the new storm. Jersey Central Power & Light has about 238,000 customers without power, while Atlantic City Electric reported more than 5,000 customers without power. The Nor’easter also cut a feed to a substation briefly on Wednesday night, knocking out power to 8,000 customers around East Brunswick, New Jersey. Ahead of the storm, authorities had warned communities they could be pummeled by this latest bout of bad weather and in New York, police went to low-lying areas with loudspeakers, urging residents to leave. New York Mayor Michael Bloomberg didn’t issue mandatory evacuations, and many people stayed behind, some because they feared looting, others because they figured whatever happens couldn’t be any worse than what they have gone through already. The city manager in Long Beach, New York, urged the roughly 21,000 people who ignored previous mandatory evacuation orders in the badly damaged barrier-island city to get out. More than 600 residents were moved from three nursing homes and an adult care facility in the Rockaway area in Queens amid fears that the weather would knock out electricity. Public works crews in New Jersey built up dunes to protect the stripped and battered coast. All construction in New York City was halted – a precaution that needed no explanation after a crane collapsed last week in Sandy’s high winds and dangled menacingly over the streets of Manhattan. Parks were closed because of the danger of falling trees. Drivers were advised to stay off the road after 5:00 p.m. Forecasters had said the nor’easter would bring moderate coastal flooding, with storm surges of about three feet possible Wednesday into Thursday – far less than the 8 to 14 feet Sandy hurled at the region. “I am waiting for the locusts and pestilence next,” New Jersey Gov. Chris Christie had said. Hurricane Sandy killed more than 100 people in 10 states, with most of the victims in New York and New Jersey. On Tuesday, the death toll inched higher when a 78-year-old man died of a head injury, suffered when he fell down a wet, sandy stairwell in the dark, authorities said. 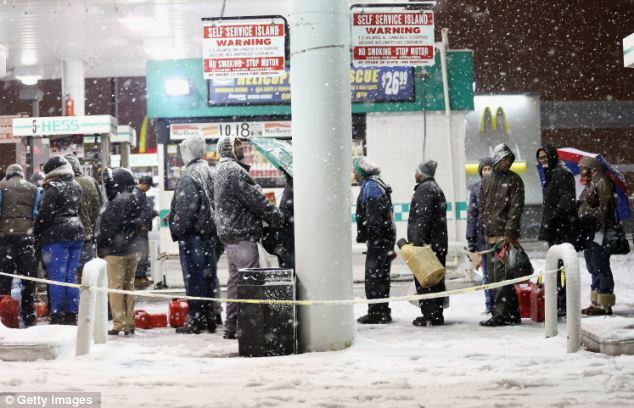 Long lines persisted at gas stations but were shorter than they were days ago. At the peak of the outages from Sandy, more than 8.5 million customers lost power. Before the nor’easter hit, that number was down to 675,000, nearly all of them in New Jersey and New York.